ehx Archives - Fret nut... Have Guitar! It’s time for another Kemper Rig Showcase and here’s TonCrate’s Febuary Kemper bundle – Clean Gain! So previsously there has been a slight focus on the heavy stuff but here is the opposite just as the bundle name suggests. Here you will get a bunch of profiles on the low gain area, from clean to crunch I’d say. As ToneCrate recommended I have added in the Electro Harmonix Soul Food overdrive. For those of you who don’t know about the Soul Food it’s practically a clone of the Klon Centaur – that means transparent overdrive. And what’s that? Well, I’d say it takes what you got soundwise and boosts that without too much coloration. It doesn’t mess around too much with EQ. And that’s about it, hope you liked the video! Feel free to support my channel by a subscription… we’re closing in on 2000 sub’s, once that is reached there will be a (pedal) giveaway to celebrate. Thank you goes out to all the already subscribers!! ToneJunkie describe this pack as “This circuit feels like a Super meets a Dumble or like a tricked out CRS” and I’d say that is pretty spot on! The pack contains 21 Kemper profiles with gain ranging from 2 to 7. No, metal style found here but there is gain enough for other styles. The profiles are really warm and responsive to your pick attack and I had great time trying them out. I do hope you liked the video and if you do feel free to support my channel by a subscription! To all my subscribers – Thanks so much for the support!! Here is a slightly different episode of Have Guitar’s Kemper Rig Showcase as the BE-2017 Baked Chicken Experiment V22 profile pack by Live Ready Sound is a slightly different pack. First of all it is HUGE! As this video was recorded it contained over 200 profiles and it’s still growing with new updates being sent out! Also it’s an experimental pack that will develop over time with user feedback. So, I decided to do more than video of this pack! This is the second video of the Baked Chicken (gotta love that name!) and there will be one more. Check out Live Ready Sound’s webpage (link below) for more details, as this profile pack has a ton of different cabs and mic’s used. The amplifier behind this is the famous Friedman BE-100, which is a very capable amp for all kinds of sounds. Very impressive amplifier and so is this profile pack! I do hope you liked this video and do by all means support Have Guitar by subscribing, the support is very appreciated! A very big Thanks goes out to all and everyone who is subing! Pedal Frenzy from Have Guitar! So what does “transparent overdrive” mean anyways? I believe that started with the legendary Klon Centaur pedal in the 90’s – what is basically does is taking what you already got and boost that. Yeah, that’s it – it doesn’t totally take over the sound, instead it can boost a good sound to something a little bit more pushed but it keeps the basic character. As the original Klon Centaur goes for ridiculous prices, a pedal like the Soul Food from EHX is a welcome alternative with a price tag much nicer for your economy. There are other alternatives as well, in different price ranges but this video is about the Soul Food so lets keep focused on that now. I hope You liked this video! If you do, please do subscribe to Have Guitar to support my video escapades! As always a very Big Thanks to you who subscribes already, you guys and girls rock! You can support Have Guitar by buying one of my high fashion Tee’s (Amazon only available in the US currently). And don’t forget – Fret Nut… Have Guitar! Recorded with a Sony FDR-AX100 and edited in Magix Movie Studio Platinum 14. Sound, unless otherwise mentioned, is recorded in Reaper. Big Muff (Green Russian) from Electro Harmonix – Pedal Frenzy! Time for another episode of Have Guitars Pedal Frenzy – in this video we’ll take a look at Electro Harmonix Green Russian Big Muff! This video is kinda “first impression” for me as I never owned a fuzz pedal before. I’ve had more distortion pedals and over-drives than I care to count but never a fuzz, but I’ve had good GAS for a Big Muff for quite a while… so when I saw the new release of the Green Russian I was so taken by the cool design that decided now is the time. Fuzz time. EHX Green Russian Big Muff has a very distinct sound that opens a fat flood of fuzzy tones. The new variant is smaller than the original (good for those who uses a pedalboard) and said to have less gain but more bass and also less “fizz”. To that you can add that the pedal has “true bypass”. What’s not to love about that, huh? Hope you liked the video and if you do please support Have Guitar by subscribing to the channel! (You’re welcome to subscribe even if you didn’t like the video…) If the channel grows the chances for more guitarrelated videos increases. A big Thanks to all of you already subscribing! 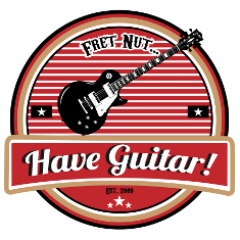 Never forget – Fret Nut… Have Guitar! Shot with a Sony FDR-AX100 in HD. Edited in Magix Movie Studio Platinum 14. Recordings in Reaper. Author adminPosted on November 23, 2017 December 16, 2017 Categories Pedal FrenzyTags bmprofiles, ehx, electro-harmonix, fret nut have guitar, green russian big muff, kemper profiling amp, Live Ready Sound, pedal frenzy, profiles, reampzone, rigsLeave a comment on Big Muff (Green Russian) from Electro Harmonix – Pedal Frenzy!